Tour Of Britain Stage Six: Devon! 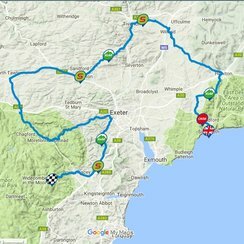 Stage Six of the Tour takes cyclists from Sidmouth to Haytor, Dartmoor. Here's what you need to know about the route. Stage six begins on the Jurassic Coast in Sidmouth, before a gruelling 150km and an overall ascent of 3,139m up to Haytor, Dartmoor. Cyclists will leave Sidmouth and head North toward Tiverton; then, once through Mid-Devon, they will enter the moor at Whiddon Down. From there, it's up to Haytor. There are loads of places to see the cyclists fly by - and they're completely free too! The Tour of Britain is an eight stage road race across Britain. This year, it started in Glasgow and will finish in London. After the Devon stage, cyclists race up toward Bristol before finishing in the capital.